Summer is for having fun and exploring new places. However, you may experience your car overheating. Here we are going to take you through a few top tips how to prevent your car from overheating. How do I prevent my car overheating? Shaded areas will become your new best friend! Where do you go to get out of the sun when you are getting too hot? Much like a human, your car will also experience a difference in temperatures when parked in a shaded area. Not only does the shade keep your car cool but it can also increase the lifespan of your car body paint. If there are no shaded areas we recommend getting a sun shade for the windows, Design911 have a range of Porsche sun visors to prevent your car from getting too hot inside. UV head shields will keep the car cooler as well as protecting the interiors from any sun damage. All temperature gauges are located on the dashboard of your vehicle and have a small needle to advise you of the current engine temperature. The needle should always be pointing in the centre of the gauge; if it points to hot, this could indicate there is an issue with your car. If this is to occur, pull over in a safe spot and turn the engine off, let the vehicle call down and take the car to your nearest garage. Engine coolant is often forgotten by car owners but is an essential part of your vehicle maintenance. This is generally checked during your Porsche service in Milton Keynes, however, you should be keeping an eye on your engine coolant throughout the year. Engine coolant is normally sold in a 50/50 mixture of coolant and water; you can purchase a range of coolants from Euro Car Parts. The coolant reservoir is located under the bonnet. We recommend only checking the coolant levels when the car has cooled down; this liquid can be very hot when the car has been on for a while. Another thing to think about is the coolant gets extremely hot and opening the cap while still warm can release a sudden spurt of pressure which cannot only be dangerous but can also damage the engine. The level of coolant should be within the maximum and minimum line, if it is below this, then you will need to fill it up. You can also have your cooling system flushed by a mechanic; flushing involves draining the system of coolant as it can get dirty and build up. Check when your car battery was last replaced or if it is a newer car check in your manufacturers guide when it should be replaced. If the battery is over three years old, unfortunately, it might not be giving out as much power as it once did which can cause the engine to overheat as it is working harder. If you are unsure on whether you need a new battery speak to your local mechanic. 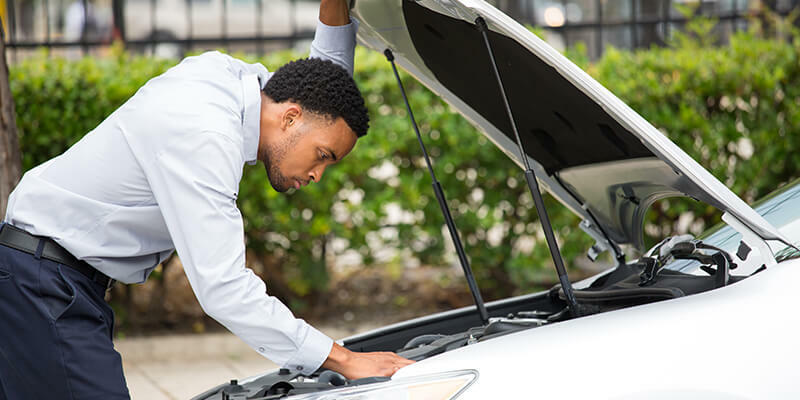 If you ever find yourself in a situation where your engine has overheated, we recommend stopping in a safe place, opening the bonnet to release the heat from the engine. Once cooled turn the ignition on to its first position and check how hot the engine is from the temperature gauge if it has returned to normal try to start the engine. If it is still hot and starts making unusual noises call your local garage. Oil is one of the most critical fluids for the smooth running of your vehicle, so it is essential it is at the right level at all times. If there is not enough oil in your vehicle, it could cause a significant amount of damage. Oil should be something you are checking regularly during your home service, to do this you can check via the dipstick which is located within the oil tank; the oil level should be within the minimum and maximum line. If this is below the minimum mark it is essential you fill it up with the specified oil stated in your manufacturers manual; you can get most oils from Unipart AutoStore. It may seem like a simple thing to say, but many people do not realise they have their air conditioning on a recirculate setting which means you are simply moving hot air around in the car. It is a good idea to turn your air conditioning into its normal setting whereby it takes cool air from outside to bring in, once the vehicle has cooled down you can turn it back to re-circulate. The temperature gauge is going to be one of the most obvious signs your engine is overheating; we recommend checking it every few miles. If it goes above the central point, it is an indication your engine is getting too hot. If you are experiencing a rather distinct smell from the engine you may want to pull over and check the car is okay, we recommend letting the car cool down and get in contact with your local garage as soon as possible. Steam coming from the bonnet is a classic sign of your engine overheating if this does happen stop in a safe place and release the bonnet. By opening the bonnet, you are allowing the cool air to reach the engine. When the engine reaches a certain point, it makes the oil too thin; when the engine is running, it can cause the car to make a range of ticking or thumping noises, which indicates the oil does not have its lubricant qualities. Taking the few steps, we have discussed throughout this article will be sure to help prevent any overheating of your car. If you would like more information on doing a home service check we recommend reading Ben and Lenny’s blog post on How to service your car at home.